Imagine you have a secret cabal with some of your colleagues where you each vow to protect a mystical power source capable of remaking the universe. Now, imagine you accidentally allowed a couple pieces of thatpower source, still remarkably powerful individually, to fall into the hands of, basically, a power crazed member of the cast of The Jersey Shore. Feeling a bit awkward? Well, that’s exactly what Iron Man/Tony Stark is dealing with in The Avengers #9. 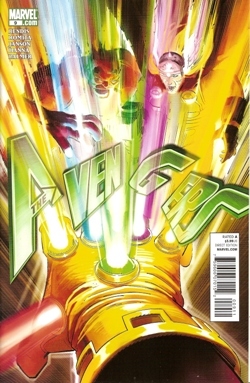 Written by Brian Michael Bendis with pencils by John Romita Jr., The Avengers #9 continues the story arc in which Parker Robbins, the Hood, has escaped from prison and somehow gotten his hands on two of the Infinity Gems (power and reality). He demonstrated his power a couple issues ago by beating the holy Hell out of Red Hulk. Last issue featured Iron Man and his Illuminati (Dr. Strange, Professor Xavier, Reed Richards, Namor and Medusa, standing in for her deceased husband Black Bolt) breaking off from the Avengers to secretly figure out how Robbins got his hands on the gems. The end of issue #8 showed Commander Steve Rogers along with the rest of The Avengers, New Avengers and Secret Avengers cornering the Illuminati in Attilan, where Rogers demands to know what Iron Man is doing. Throughout this issue there are flashback scenes of Robbins in prison, trying to get out. He attempts bribing guards to no avail. Eventually, he meets an inhuman name Ertzia who is in prison for murder. The two strike up a friendship and Ertzia, formerly one of Black Bolt’s adviser’s, begins sharing secrets of the Inhumans with Robbins. Finally, near the end of the issue, one of the prison guards tells Robbins that if his offer still stands, the guard will help him escape. The issue ends in the present when Robbins teleports himself to his former partner (in more ways than one), Madam Masque, and uses his reality warping powers to fix the scars on her face. This story arc is moving a bit slow, but it’s still very entertaining. Bendis has created a very interesting scenario for The Avengers to face that is not only a physical challenge, but a challenge amongst their ranks as well, due to the mistrust created by Stark and the rest of the Illuminati. It’s really looking like it’s going to keep getting more interesting as time goes on. Romita Jr.’s art is always superb, but this series hasn’t felt like his best. That said, issue #9 was really excellent. It felt much more concise and tight. He captures Commander Rogers’ rage fantastically. Another benefit of Romita Jr.’s artwork is the fact that he apparently doesn’t agree with the decision to turn Beast into a cat, as evidenced anytime Beast gets featured. Overall, this is definitely a series to be picking up regularly. It’s going to get really interesting to see the conflict develop between Iron Man and Commander Rogers. This issue felt almost like a return to “Civil War,” and at a couple points I thought Rogers was going to straight up punch Iron Man. Stick around! This book’s really getting good!